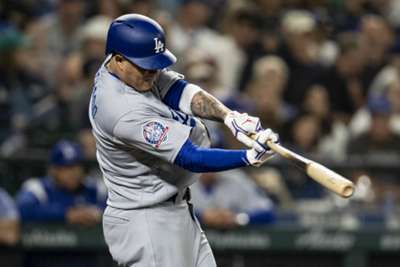 Los Angeles Dodgers third baseman Manny Machado left Sunday's 12-1 win against the Seattle Mariners after being hit by a pitch. Mariners shortstop Andrew Romine, working garbage time with the Dodgers up 12-1 in the ninth inning of the MLB clash, hit Machado just above the left wrist with a fastball. Machado – acquired from the Baltimore Orioles – stayed in the game to run, but was replaced by Justin Turner in the field in the bottom of the ninth. The Dodgers later reported that X-rays were negative for the four-time All-Star and two-time Gold Glove winner. "I'm good, guys, nothing crazy," Machado said. "No bone, no nothing."